Rediscover your confidence, smile, and youth. When a lifetime of poor dental health, a long-term health condition, or an accident leaves you without teeth, you may find yourself in the middle of a crisis. We understand that you need your teeth to perform some of life’s most basic functions such as chewing, speaking, and smiling. Full or partial dentures can restore your smile to its former glory. Full or Partial: What’s the Difference? A full denture is a complete set of artificial teeth when there are no remaining natural teeth. A partial denture is a set of artificial teeth that are designed to fit around any remaining natural teeth. Both types of dentures are suitable for the upper or lower jaw, and many patients find it necessary to use dentures and partials in both jaws at once. Without hesitation, I would offer up my recommendation to Drs. Coakley and Trainor for anyone in the area. Between the Hollywood theme, the friendly admin staff, and the gentle (I'm a baby at heart) treatment by the dentists and their assistants, I was well looked after on every visit. I have been a patient since 1999, and I wouldn't go anywhere else! You deserve a smile that feels like your own! For our first-time denture or partial wearers, our Woburn dentists will take impressions and measurements of your gums and mouth to create a template for your new teeth. These records will be forwarded to a dental lab where the framework for the denture or partial will be designed. These replacement teeth will be completed in several stages, with try-ins and adjustments scheduled throughout the process. When the framework is found to fit comfortably, and the artificial teeth look and feel as natural as possible, the entire appliance will be returned to the lab for final processing. You deserve to have a smile that feels and looks like your own, even if you have artificial teeth. 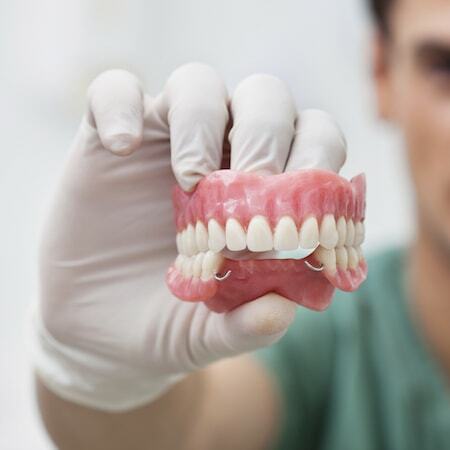 For that reason, we offer several options for making your dentures and partials one-of-a-kind. You will be offered the opportunity to provide input into the selection of the shape and height of your artificial teeth, the color of the gum tissue, and the color of the teeth. If you have lived with dentures or partials for many years, you might find that they no longer perform, fit, or look as nice as you would like. Our team can evaluate your artificial teeth, adjusting and relining when appropriate or replacing it entirely when necessary.